Portable generators offer all the benefits of a generator but in a more convenient and easily transportable package. I created this list of the 10 best portable generators from research and experience. A generator is something that’s good to have on hand because you never know when you might need it! Here are the 10 best portable options on the market right now. When you think of a generator, the design is probably the last thing on your mind. Nonetheless, the Yamaha EF2000iSv2 manages to be quite beautiful. The retro-inspired look and the royal blue hue aren’t just window dressing either. This portable generator is a consistent best-seller from a very trustworthy brand. It’s rated for 1600 watts and it’s remarkably quiet (click here to see the quietest ones), thanks to its muffler and spark arrestor. This generator is lightweight and compact, making it ideal for tailgating and camping. It’s parallel-ready and CARB compliant. It has inverter technology, so even sensitive electronics will be safe. With a 500W load, this Yamaha generator will last around 8 hours. The fuel efficiency is possible thanks to the smart throttle system which also reduces noise. Yamaha includes a number of features that make it user-friendly, like a fuel gauge, a low oil light, and an auto-decompression system that means an easier start. 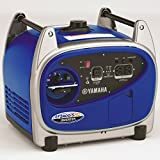 IMHO: In My Humble Opinion You really can't go wrong with the Yamaha EF2000iSv2, it's my favorite one this year and tops this top 10 best portable generators list. It provides enough power for things like tailgating and camping, it performs well and consistently, and it's aesthetically pleasing as well. One of the most popular 2000 watt portable generators, the Honda EU2200i (full review here), has multiple features that made its previous version (the Honda EU2000I) a crowd favorite. 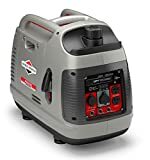 Perfect for home use, camping, at the job site, and many more applications, this Honda inverter generator can tackle a wide variety of appliances. It’s high power output and lightweight make it a solid workhorse for just about any job. While it is not as attractive as other generators, this generator makes up for it in many other important categories. To me, this is the best portable generator this year, a great successor to the all time favorite EU2000I. When measured at 23 feet, the industry norm, the Honda EU2200i only output 48 to 57 dBa. As a comparison, this is less decibels than a normal conversation making it a great choice for those worried about noise control. Most generators can exceed 70 dBa at 23 feet making them somewhat of a nuisance for running overnight or with close neighbors. With this generator, you can easily power appliances for long periods of time without worrying about noise pollution. Honda has kept the end user in mind and has designed this generator to be as user friendly as possible. 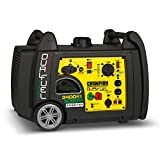 The easy to use recoil start, convenient layout, and easy to read labels add to the many reasons why this generator currently has a 5 star rating with over 100 reviews on Amazon at the time of this article. As with any portable generator, you are going to want it to be, well, portable. That is where this EU2200i really beats out the competition, weighing in at only 40lbs. This makes it really easy to transport it to any place you need power on the go. Featuring Honda’s exclusive Eco-Throttle System, this generator gets excellent fuel efficiency and can run 4-9.6 hours on a single tank depending on how much of a load is on the generator. This generator features two AC out 120v 15A outlets and a DC 12V 8.3A to provide you with easy access to your power. Honda has also included parallel ports to power two generators at once for up to 4400 watts of power. It is also loaded with several different LED alerts that will warn you of any problems to prevent damage to your generator. The oil alert illuminates when your oil level is getting low to keep your generator’s motor protected. An overload alarm will light when there is a power overload that exceeds the capabilities of the generator or there is a short circuit in a connected appliance. Overloads can cause catastrophic failure to generators, and this is just another way Honda stands behind their products. The last light is the output indicator light and it will illuminate green when the generator is producing electrical power at the receptacles. IMHO: In My Humble Opinion The Honda EU2200i is the best portable generator according to customer reviews. A high performer in a small package. 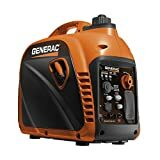 This is a great generator to have on hand when working around the job site, campsite, or even at home for a backup source during a blackout. I consider the Honda EU2200I to be the best portable generator for most people, as well as the most reliable portable inverter on this list. Most generators have pull cable recoil starters so a generator with an electric start always feels like a treat. Just turning the 3-position toggle switch is just so much easier than yanking on a cable and it’s especially nice for those with injuries or a general lack of upper body strength. At first glance, this generator looks almost like some kind of kid’s toy. Up close, that bright yellow panel is really very clear and easy to understand with everything clearly labeled. Rated for 3100 watts, this generator has enough power to handle a lot. It’s an inverter so your sensitive electronics will be protected with that clean energy. This is a dual-fuel generator so you can use either gasoline or propane. This Parrallel-ready generator can run on Propane or Gas out of the box! It has decent fuel efficiency, with a tank of gas getting you up to 7.5 hours. Noise isn’t a problem. In fact, it’s surprisingly quiet given the amount of power it has. This portable inverter is a great choice for the RV with its RV-ready outlet. It will also work well on a worksite or as a backup power source for your home. The Champion 3400-Watt generator is quite heavy at nearly 100 pounds, but it does have tires and a pull handle built right in so transport isn’t all that difficult. Click here to read my full review of the Champion 3400W portable inverter. IMHO: In My Humble Opinion It's not the cheapest, but this dual-fuel inverter generator from Champion Power has a lot to offer. It has plenty of power, it's RV-ready, and it has an electric start. This generator from Briggs & Stratton offers both power and convenience. It weighs 85 lbs but it has wheels and a telescoping pull handle. It has four standard household outlets, more than most other generators offer. There is also a 12-volt 30-amp locking outlet with RV adaptor, a DC charging outlet, and a USB port. This makes it an ideal generator for a number of situations, from a backup home power source to tailgating or camping to RV use. A 1.5-gallon fuel tank gives you enough juice to last over 10 hours on a 500-watt load. A special quiet power technology setting will automatically adjust the engine speed, resulting in less noise. This mode will also save fuel and increase run-time. One really nice feature of this generator is the LCD display screen. This shows things like the current amount of power being used and also notifies you of when it’s time to perform various maintenance tasks like changing the oil or spark plug. The P3000 is rated for 2600 watts (running watts) but you can effectively double that by running two of them in parallel. One downside to this portable generator is that it is not CARB compliant. Because it doesn’t meet their strict emissions guidelines, this generator can’t be shipped to California. It is a transportable inverter that offers safe and clean energy for powering electronics. IMHO: In My Humble Opinion Four outlets and a helpful LCD display make the versatile Briggs & Stratton 30545 P3000 generator stand out. However, it is pretty expensive and it doesn't meet EPA and CARB emissions standards. This generator from WEN offers clean energy, with the inverter mimicking a pure sine wave. It is also EPA and CARB compliant and has very good fuel efficiency. The quiet operation is a major selling point for this mobile generator. At a quarter load, it only registers at 51 decibels, about the same noise level as typical conversation. This ultra quiet operation makes it a great operation for things like camping where you don’t want to disturb others near you. An eco-mode option will result in the absolute quietest operation while also boosting fuel efficiency. You won’t be able to operate at max capacity in the eco-mode, however. The WEN 56200i (click here to read my full review) has two three-prong 120V receptacles, one 12V DC receptacle, and one 5V USB port. It’s also parallel-ready. Transport is easy with this lightweight generator because of its convenient carry handle. There is no fuel gauge, but there is an automatic shutdown feature if you are close to running out of either fuel or oil. IMHO: In My Humble Opinion This is a good portable generator for situations where noise is the most important consideration. In addition to its ultra quiet operation, this generator offers consistent performance and quality construction. Generac offers another generator that has incredibly quiet operation. An economy mode will result in the quietest noise level while also increasing runtime and fuel efficiency. Operation of this unit is pretty user-friendly. There is no fuel gauge but there are indicator lights to let you know if you’re running low on oil or if you’re overloading. This generator is extremely compact and lightweight. It also has a convenient carry handle so this generator is ideal for transport. This makes it great for tailgating and camping. Rated for 1600 watts, it also has just enough power to handle some home backup in case of power outage. It is parallel-ready with an add-on kit (click here to check the latest price on amazon for the parallel kit), so you are able to handle a bigger load when you run two of the units together. The inverter functionality means that your electronics will be safe with clean and stable power. The outlets are all covered, a nice feature that prevents any dust or debris from damaging the unit when not in use. IMHO: In My Humble Opinion The Generac 7117 GP2200I is ultra quiet and also extremely compact and lightweight, it's ideal for easy transport for camping and tailgating. This generator from Yamaha isn’t super lightweight but the 75-pound weight is manageable and it is still portable thanks to the dual handles. Rated for 2000 watts, it provides more power than many similar generators. It offers clean and safe energy with inverter technology. This generator typically starts quite easily because of its high current output. This makes it great to power high starting watts appliances like an air conditioner. It uses Pulse Width Modulation for stable and clean energy that is safe for electronics. The speed of the engine will automatically adjust with the smart throttle technology, resulting in better fuel efficiency and less noise. This generator does have a fuel gauge and a low oil warning light. The cast iron cylinder liner helps protect the engine and keep it running well for years. Yamaha is also known for making excellent engines. The 5.5 HP engine provides a lot of power and reliability but it will also burn more fuel than a lower-HP engine. Like with the Yamaha EF2000iSv2, this portable generator is another example of a reliable, powerful tool that also has a great looking design. This model is heavier and a bit bigger than the EF2000iSv2, but it has a similar aesthetic. IMHO: In My Humble Opinion The Yamaha EF2400iSHC is a great looking generator that performs consistently and provides a good amount of power. Like the Energizer Bunny, this generator just keeps going and going. With a 500-watt load, you can expect it to keep going for over 9 hours. It will even last quite a while when running at 100% capacity. Rated for 1600 watts, this generator can handle sensitive electronics and is parallel-ready. It doesn’t have RV-capability built in, but you can buy RV outlets to use with it. The economy mode automatically adjusts the throttle to save you on fuel, boost runtime, and lower noise level. Even when operating at full load and not on the economy mode, though, this never gets overly loud. This makes it a nice choice for camping and tailgating or any situation where you don’t want to disturb others near you. 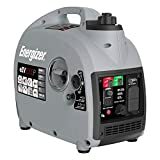 The Energizer motto is all about durability and they back that up with a 3-year limited warranty. Rated for 1700 watts, this generator from Briggs & Stratton is a good value. When using the quiet power technology option, the engine adjusts automatically depending on load, providing better fuel efficiency. It’s not as quiet as some generators but it is pretty quiet, similar to the noise level of typical conversation. At just over 50 pounds, it’s pretty lightweight. It has an H-handle design to make it easy for two people to carry. It’s also pretty compact. The 30651 is parallel-ready and you can connect any of the generators from the PowerSmart Series. IMHO: In My Humble Opinion With its compact design and its consistent performance, the Briggs & Stratton 30651 inverter generator will serve you well while tailgating or camping. 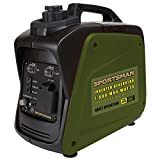 This generator looks exactly like how you might expect a generator from a brand called Sportsman to look: rugged and camo green (click here to read my full review). This generator is only rated for 800 watts, so it’s not going to have enough power for a lot of uses but it should be enough for some camping and tailgating use. It has a very low price tag to compensate for the lack of power. The overall quality of construction is also a bit lacking, though, with some cheap plastic housing that might not stand the test of time. It does feature inverter technology so it can handle electronics like laptops or cellphones. It is CARB-compliant. The 0.55-gallon fuel tank will last for just over 6 hours at a 50% load. This is one of the louder portable generators. It’s 56db when it’s on but not running a load at all, which is quite a bit louder considering the wattage. IMHO: In My Humble Opinion This portable generator from Sportsman has some serious problems but it also has promise. If you're looking for an affordable portable generator and you don't need too much power, this is worth looking at. Who can repair a portable generator? In some cases, you may be able to repair a generator yourself if you’re generally handy and have some basic technical repair skills. There are some helpful online resources, like this video. For most people, though, trying to do a repair yourself isn’t a great idea. This is especially true if your generator is still under warranty, as trying to fix something on your own will disqualify the warranty. You should always have it fixed by a certified repair person. You can find a list of qualified people through the manufacturer. You can also generally find help from any authorized dealer. Most experienced small engine mechanics should also be able to help with most common generator problems. Can a portable generator run my air conditionner? The answer depends entirely on the size of your air conditioner. For most air conditioners, you’ll be looking at 2800-3500 starting watts and 1300-2000 running watts. The Yamaha EF2400iSHC uses a high current that can easily start a high efficiency 13,500 BTU air conditioner even in temperatures up to 110-Degree F.
There are a lot of situations where an extension cord will be necessary. For example, if you want to use your generator to power an indoor appliance, you’ll need to run an extension cord outside to your generator. It’s important to only use a heavy duty extension cord. It’s also very important to make sure the extension cord is in good condition without any cuts and with all three prongs in working order. As long as you use a heavy duty cord in good condition, it’s perfectly safe to use an extension cord with your portable generator. Is it a good idea to build an enclosure for my generator? Yes, building an enclosure for your generator can be a very good idea. A major reason for building an enclosure is to reduce the overall noise level. An enclosure can significantly bring down the generator’s total noise level. Enclosures also protect the generator from the elements and prevent any dust or debris from causing damage. Making a DIY enclosure can be done pretty easily at minimal cost. There are a number of helpful tutorials available, including this video. Can I run an entire house with one of these? That depends on what exactly is meant by an entire house but the answer is likely no. You should be able to run a handful of appliances in the home but there is no way that a portable generator has enough power to run the entire house’s power. If you run two generators in parallel, you’ll be able to run more of the home. When using a portable generator as a backup power supply after a power loss, you’ll generally have to pick and choose what tools and appliances are more of a priority. You can use our Wattage calculator to estimate how much power you are going to need. How often should I change the oil and what should I get? You should always follow the manufacturer’s recommendations for all maintenance. Typically, you’ll be told to check the oil before every use. After so many hours of use, it will be time to change the oil. For the Generac GP2200I, it’s recommended that you change the oil after 50 hours of use. For the Honda EU2000i, it’s recommended that you change the oil every 6 months or every 100 hours, whichever one comes sooner. You should always use the type of oil recommended by the manufacturer. Honda recommends SAE 10W-30 while Yamaha recommends 10W-40. What are some common problems I may encounter? Should I keep it at a distance from my house? Yes, in fact, it’s important that you keep your generator at least 15 feet away from your house. It’s vital to keep a healthy distance in order to prevent carbon monoxide poisoning. You should never run your generator inside a closed area like a home. When running, the generator should be at least 15 feet away from any open windows or doors. Don't run a portable generator when it's raining. Turn the generator off and let the engine cool before refueling. If using an extension cord, make sure it is heavy duty and in good condition. Install a transfer switch to safely power hardwired appliances. There you have it. Hopefully, this portable generator buying guide has helped you figure out which generator is the best option for you and made you aware of things you should consider. Once you use a generator, you’ll wonder how you got along without one before. Just remember that it’s important to take good care of your generator and perform routine maintenance. Portable generators offer good value but they are still an investment, so you should protect that investment. Have you owned a portable generator before? Is your favorite missing from this list? Let us know in the comments. Hi Matt, what an excellent web site. Thank you for sharing your insights and experience. Have you take a closer look at the Honda EU3000IH1A and the Honda EU3000IS1A? Aside from the obvious differences, what are some of the finer items that I may not notice from the general literature. The EU2200i is about 200w more powerful with a different engine (Honda GXR120 four stroke engine), it is also slightly quieter but the difference is too small to really notice. It is a better choice overall I will put up a review soon. I believe Honda is going to discontinue the EU2000i.